There’s no longer any doubt about the beneficial effect of green plants in the office. They lower carbon dioxide and increase humidity, and they may filter airborne microbes. Having plants around the office boosts morale and performance, reduces fatigue and stress — and gives a positive first impression to visitors too. Gardening and looking after plants are therapeutic for several health issues — they put you in a better mood or relationship to start with and, if necessary, you can easily find out which plants do and don’t trigger your allergies. According to studies, hospital patients with plants in their room are more positive and less stressed. And at schools plants appear to raise attendance figures. Spider plants (Chlorophytum comosum) are low maintenance and good indoors, and so are dracaenas, golden pothos (Epipremnum aureum), also known as devil’s ivy, and Areca palms (Chrysalidocarpus lutescens). Feng Shui practitioners recommend palms and Pachira money trees, and plants with rounded leaves like rubber plants or jade plants for prosperity. Orchids are associated with love, fertility and virility, and morning glory is supposed to bring peace and happiness. Lotus and lilies together are said to bring luck and purity. Spiky plants like cactus should not be kept in small rooms. But although caring for plants theoretically increases compassion and may even improve relationships, it takes a trained eye to choose which plants will reflect the character of your business and an expert to look after them efficiently, who knows when to water, prune or fertilize. 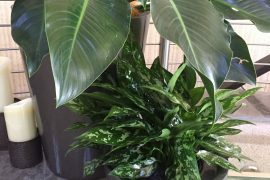 After all, most office plants die from either overwatering or underwatering! So it makes far more sense to hire rather than buy, and to sign a contract with an experienced professional like Bretts Plants. We can devise a creative solution to any plant problem you throw at them, and can design a personal and individual ‘plantscape’ for you. We are family business and our first-class customer service will make sure that your plants remain healthy and bright — and suit your image, meeting all your environmental and aesthetic goals. Contact us today to know more about how we can help you. You may also like: Not just for the home: Wowing your clients with business plants!